Across most of the South and Midwest the rut is in full peak or beginning to fade out. Some hunters will hang up their hat and quit until next year, but for those of us with unfilled tags and the determination to hunt to the end, we must be creative with our post-rut strategy! 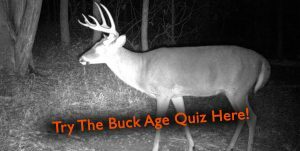 I will highlight several post-rut strategies to increase your odds of tagging a buck in over-time. In most deer herds there will be some amount of breeding behavior for a few weeks to a month after peak breeding. This is caused by doe fawns just becoming sexually mature and coming into heat, as well as does that may have not been bred their first cycle or her fertilized egg was not implanted properly after being bred her first time. At any rate, persistent hunters can find success in the weeks following peak rut if they are lucky enough to find a doe in heat. Modify your original rut hunting strategy to target the thickest cover where bucks may still be comfortable cruising even after heavy hunting pressure. It’s also imperative to focus your efforts on areas that are still holding does. Often this time of year much of the landscape can seem barren of deer as they have retreated to small cover patches where they have not encountered human pressure. You need to find areas where deer are still comfortable, identify a low-pressure access route, and sit tight in hopes that a cruising buck will find the does. The post-rut period when few does are left in estrous is a great time to catch up with a mature buck. With only a few opportunities left to breed, bucks must search far and wide to find an estrous doe. Every year I get my most consistent trail camera photos of mature buck day movement during the week(s) following peak breeding. You need to be out there waiting on him! Once the rut finally settles down and all the does have been bred, bucks will change their focus from breeding to survival. That means they will be seeking out dense cover with little human pressure and lots of food. In the Appalachians this means mountain laurel and rhododendron thickets. In other areas of the country this may be timber stands that have a thick understory following a timber harvest. In the Midwest, or any ag dominated system, this may be unharvested or recently harvested crop fields. The key to being successful in late season is to cover lots of ground and spend a lot of time scouting. You must identify high traffic areas by finding fresh deer sign. I concentrate on areas with lots of tracks, and if there is a decent amount of deer droppings there that sweetens the deal even more! When beginning your search, whether on public or private ground, identify areas that have been overlooked previously this season. In late season security and cover are king to deer. They will always choose areas where they feel more secure for daylight movement even if that means less food. They will simply hang back in the cover until last light and then begin traveling toward major food sources. Concentrate your hunting effort on the edge of thick cover or just inside it. Don’t be too discouraged if you can’t see a long way, it’s better to see one deer in shooting range than be able to overlook a vast empty field that won’t hold deer until after dark. Hunting after the peak rut and into the late season can be a real test of your grit and determination. It can also yield the best hunts of the year if you are in the right spot where all the deer are concentrated because they have food and feel safe. Spend the post-rut hunting thick cover that hold does and keep scouting hard so that you keep tabs on where the deer currently are. As the season becomes colder and food more limited concentrations of deer can make your last month of hunting the best yet! Stay positive, stay mobile, scout hard, and never give up!